Finished Size: 3.75" x 5"
This little guy was my first effort at doing a portrait-style picture of a person. The first version of the pattern was done on graph paper, using an odd sort of shorthand that used one graph square for 4 stitches. With that method, I had hoped to be able to encompass both the flowing lines of the robe and staff, and still be able to pick out the finer details of the collar and crown. When I actually did the stitching, I made a bunch of changes as I went along, but never recorded them onto the pattern (improvisational needlepoint :). Even with the in-hand changes, I'm not totally happy with the way he turned out, so for the computerized version, I've made some modifications. 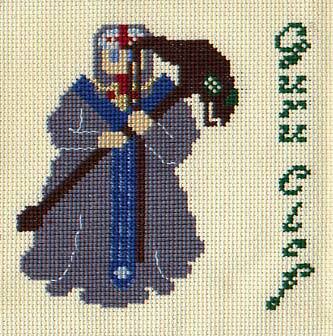 The most notable change swaps out the backstitching, which never quite looks right in my designs, for some full-sized outline stitches in the robe. The color scheme for the jewels is a bit expanded, and there are some changes to the tabard and staff as well. It's still a work-in-progress, so feel free to add your own accents, as usual. Magic Knights Rayearth is a great series to use for needlepoint, with its broad color palette and mystical atmosphere. Guru Clef has a pretty distinctive costume that's not too complex, which is why I picked him for this project. Years later, I did a set of three related Rayearth patterns, focusing on the Magic Knights themselves, for my Shoujocon squares project. Symbols are much more my cup of tea, I think.